Generally, when buying a pair of binoculars for your next hunting trip you’ll have a number of things to look for in order to get one that fits you best. On compact binoculars, the strong point is as you may have already guessed, the portability. On the standard ones is generally the image quality and on the Astro is the build quality and magnifying power. Of course as in any domain, there are binoculars that incorporate in one way or another all these features, and some that cover only two, or just do their best in the category they fit in. Next, you need to look at the most important thing on a binocular. Optics. Without good optics binoculars are useless. And here the most important aspects are the eye relief, the apparent viewing angle and the minimum focus distance. The eye relief is the distance between the lens and your eye, so generally on the apparent angle of view and the eye relief, bigger numbers mean better performance, and on the focusing distance, smaller is better. Now as a hunter you need to look up at your own necessities. Generally, these pieces of advice apply to anyone, still, for example, there are hunters that prefer middle-sized binoculars more, but that varies from person to person. Maybe you want ease of carry, best optics or best convenience. You’ll need to think of your own needs and then check the list to see if any of the binoculars here, which in our opinion are some of the best out there, fit your needs. Bushnell is well-known for producing high-quality hunting equipment at reasonable prices, and the Bushnell PowerView 10X50 Porro Prism Binoculars are no exception. Speaking of optics, the Bushnell features a high-quality BK-7 prism multi-coated lens that ensures bright and crisp images, a big 10X magnifying power, a 50mm objective lens that offers high distance viewing and a patented InstaFocus system for (obviously) instant focusing. The eye relief is 10mm, the eyecups are a fold-down type which favors eyeglass wearers too, and the minimum focusing distance is 20 ft. which is reasonable for hunting binoculars at this price. The construction is solid, having a weight of 25 ounces, and a non-slip rubber armor that absorbs shocks while providing a firm grip, and the Realtree AP camouflage ensures that you won’t be easily spotted by your pray. 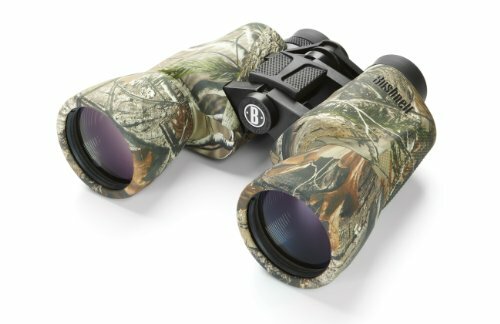 The Bushnell PowerView 10X50 is a generally good performer in every aspect from optics to build quality still maintaining a reasonable price. If you consider this item has what you want, you can buy it with confidence. Nikon is one of the best companies in the world the manufacturing of high-quality optics for cameras, measurement instruments, and even microscopes. The Nikon Trailblazer has some key features that you won’t easily find on another pair of hunting binoculars and here we can include a smooth central focus knob for quick viewing, bright multicoated optics with multiple layers of anti-reflective compounds that offer excellent resolution and illumination, and BaK4 high index prisms that offer high-resolution images thanks to the advanced prisms from Nikon. Other specifications include a 10X magnification, a 60-degree apparent angular field of view, a 10mm eye relief, a close focusing distance of 11.5 ft and a 2.5mm exit pupil. 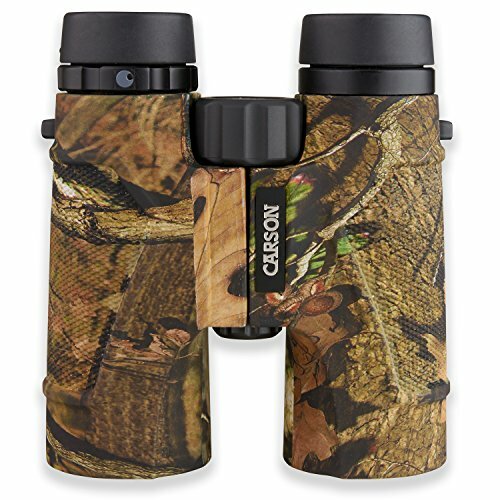 The build is durable and protective having a rubber-armored coating that provides a fast non-slip grip when both wet or dry, at 10 ounces and a size of 4.1 X 4.5 inches (LXW) the Nikon binoculars are pretty compact when comparing them to, for example, the Bushnells. Also, the waterproof and fog proof capabilities will help you operate in harsh environments. 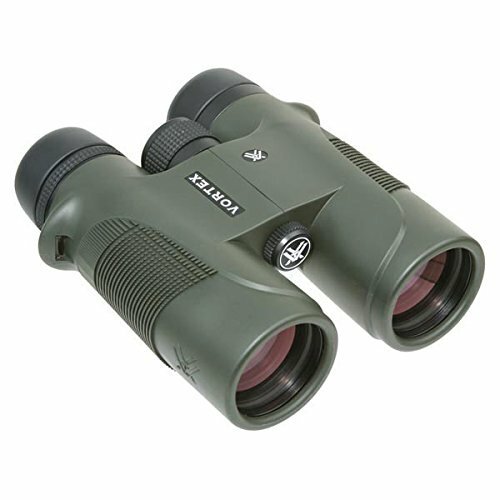 Overall this pair is great if you want good optics encapsulated in a quality hood and can be considered a smart choice as your next hunting binoculars. Vortex offers a VIP Unconditional Lifetime Warranty for this pair, so you can literally make everything you want to these binoculars and Vortex will repair them, no questions asked. It has a full-size roof prism, a 10X magnification, a 42 mm objective lens, multi-coated optics which increases light transmission and phase corrected prisms that enhance resolution and contrast, a 16mm eye relief, 6.6 degrees angular field of view, and a close focus of 5 feet which is one of the best among the binoculars we reviewed. It is waterproof due to the O-ring that seals and prevents dust, water and any kind of unwanted material from penetrating the riflescope, fog proof that is ensured by the argon gas and it has a rubber armor that provides secure, non-slip grip and durable external protection. As convenience features for paying a bigger price, you get an adjustable diopter for eye differences, a center focus wheel that adjusts the focus of both binocular barrels at the same time, tripod adaptability and adjustable eyecups that twist up and down for comfortable viewing. 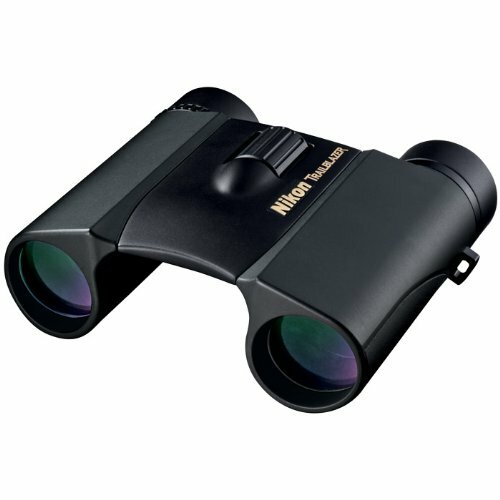 These binoculars are great for hunting in all the aspects presented. If you consider it has what it takes, you can make yourself a nice present knowing that the Vortex binoculars won’t fail you. Carl Zeiss doesn’t stand back in terms of quality. It provides highly durable and incredible high-quality optics without compromises. You may pay a higher price for the Conquest binoculars but they deserve every buck. For hunting purposes, it offers anti-reflective lens coating for use in most lighting scenarios, astounding low weight for use of carry, waterproof and fog proof capabilities assured by the temperature resistant non-slip rubber armor and the nitrogen filling. It features a 10X magnification, 30mm objective lens diameter, a 3 mm exit pupil, a field of view of 288 ft., a close focusing range of 10 ft., a diopter range of +/- 7, and an eye relief of 14.6 mm. It has a functional temperature range of -4/+131 degrees Fahrenheit, dimensions of 5.2 by 4.53 (HXW) and a weight of 18 ounces. It comes at a great piece, it has awesome specs and has a nice limited lifetime transferable warranty from Zeiss to get you covered when having trouble with your item. You can make the purchase knowing that you bought a high-quality pair of binoculars that will last for years. The full-sized 3D binoculars combine HD optical coating technology with ED glass to give you the brightest and clearest images possible. It is ideal for hunting, bird watching and other outdoor activity due to its sneaky mossy oak camouflage and the features it incorporates. Speaking of optical features it has fully multi-coated lenses, a 10X magnification 42mm objective lenses, a high 314 ft. field of view, an eye relief of 16mm, phase correction coatings on the prisms, and a close focusing distance of 10 feet. 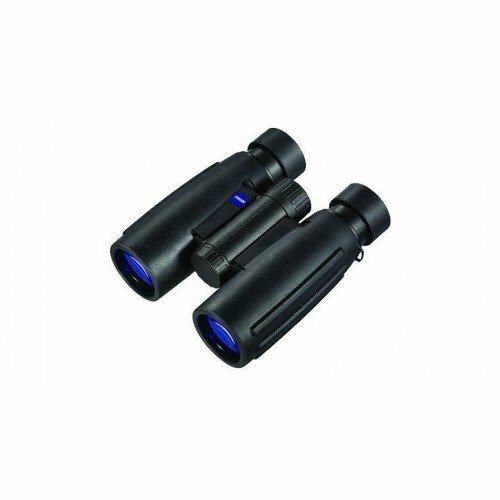 The standout features of these binoculars are firstly the lightweight and compact body that looks great then the quality of the materials from which they are made of. The mossy oak camouflage offers stealthiness and certainty that your hunt won’t spot you and the rubberized armor textured coating offers a firm grip and an overall good feel when holding the Carson 3D series. Generally, there are no weak points on this particular model but if I had to be very picky, a better field of view would have been an overall better choice, but again that’s not a major thing to consider. The quality of their accessories is also good. Backed up by America’s Best Binocular warranty, the Carson 3D series high-definition binoculars are a safe purchase that will help you look for your prey at far distances and low light environments. 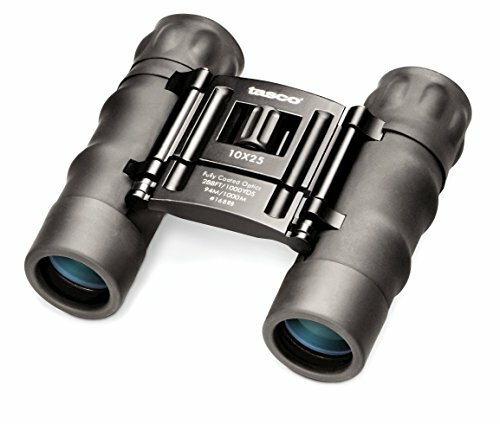 The Tasco Essentials Binoculars are a pair of good ultra-affordable compact pair of binoculars that will do the job in most situations especially if you don’t want to pull out large amounts of cash out of your pocket. It offers good optics and a somehow quality construction in a compact non-waterproof casing. It offers an 8X magnification, 21 mm objective lenses, a surprising 383 feet field of view at 1000 yards, a 2.6 mm exit pupil diameter, an angle of view of 7.3 degrees, an eye relief of 15 mm and a relative brightness of 6.9. All of this comes in a small body weighing only 0.41 lb. or 6.5 ounces. The housing is water-resistant however not waterproof, it has a compact bridge design with a yellowish camouflage rubber armor. One of the cheapest items we reviewed, the Tasco Essentials are a great way of spending your hard-earned money on a pair of binoculars that does their job nice and reliable. If you consider it’s enough to track your prey, you can make the purchase. We hope you found a pair of hunting binoculars that satisfies your needs, we tried our best to include some of the best performers in the binocular world when speaking of optics, build quality and overall feel. However if you still haven’t found what you want, at least you now know what to look for when searching for a good pair of hunting binoculars.